The overreliance on dwindling fossil fuel reserves and the negative climatic effects of using such fuels are driving the development of new clean energy sources. One such alternative source is hydrogen (H2), which can be generated from renewable sources. Parageobacillus thermoglucosidasius is a facultative anaerobic thermophilic bacterium which is frequently isolated from high temperature environments including hot springs and compost. Comparative genomics performed in the present study showed that P. thermoglucosidasius encodes two evolutionary distinct H2-uptake [Ni-Fe]-hydrogenases and one H2-evolving hydrogenases. In addition, genes encoding an anaerobic CO dehydrogenase (CODH) are co-localized with genes encoding a putative H2-evolving hydrogenase. 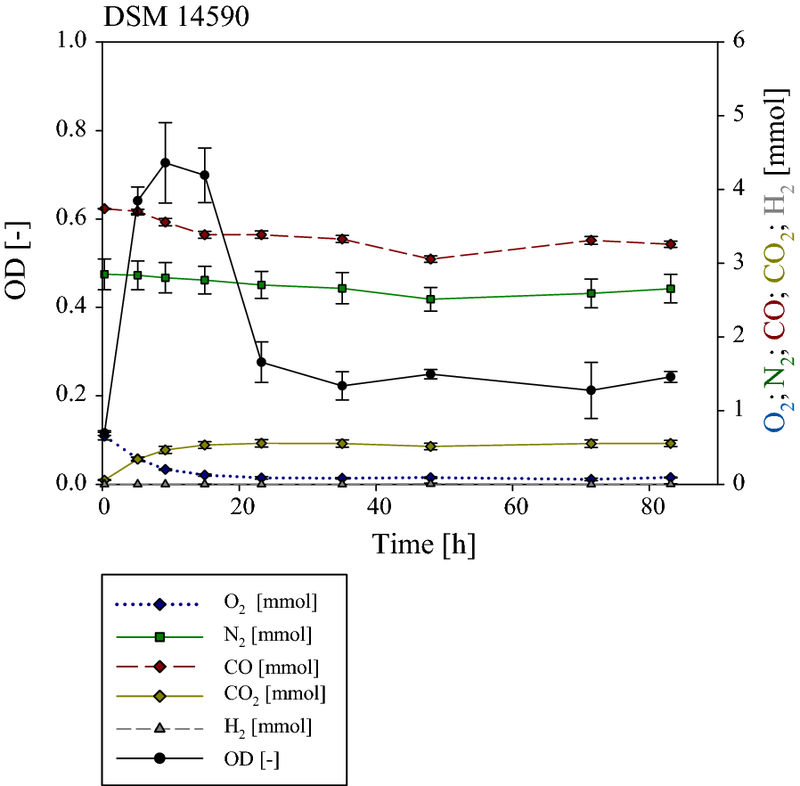 The co-localized of CODH and uptake hydrogenase form an enzyme complex that might potentially be involved in catalyzing the water-gas shift reaction (CO + H2O → CO2 + H2) in P. thermoglucosidasius. Cultivation of P. thermoglucosidasius DSM 2542T with an initial gas atmosphere of 50% CO and 50% air showed it to be capable of growth at elevated CO concentrations (50%). Furthermore, GC analyses showed that it was capable of producing hydrogen at an equimolar conversion with a final yield of 1.08 H2/CO. This study highlights the potential of the facultative anaerobic P. thermoglucosidasius DSM 2542T for developing new strategies for the biohydrogen production. In the next 30 years, the global energy demand will expand by ca. 30% and the vast majority (ca. 85%) of the energy resources required to offset the rising demand will come from non-renewable sources such as natural gas and crude oil . This will result in increased pressure on the dwindling fossil fuel reserves and in greater emission of greenhouse gases into the Earth’s atmosphere. There is thus an urgent need for further development and implementation of clean and renewable alternative energy sources [2, 3]. Hydrogen (H2) has recently become prominent as a very attractive clean and sustainable energy source, especially when generated via ‘eco-friendly’ strategies. In comparison to other fuels, H2 has the highest energy content (141.9 MJ/kg higher heating value) . Additionally, its complete combustion with pure oxygen produces only water (2 H2 + O2 → 2 H2O) as a by-product. The majority of current industrial H2 production strategies, such as coal gasification, steam reformation and partial oxidation of oil, are unsustainable, harmful to the environment, energy intensive and expensive [4, 5]. As such, over the past few years, the production of H2 via microbial catalysis has drawn increasing interest. Several different strategies to produce biohydrogen, such as photofermentation of organic substances by photosynthetic bacteria, bio-photolysis of water by algae and dark fermentation of organic substances by anaerobic microorganism, have been explored . These strategies have the advantage of lower energy expenditure, lower cost and higher yields than the industrial methods . Another advantage is the potential to use cheap feedstocks, such as lignocellulosic waste biomass, which can be converted into a gas mixture termed ‘synthesis gas’. This gas consists primarily of carbon monoxide (CO), carbon dioxide (CO2) and H2 . In a further step, the CO can react with water to generate H2 via a biologically- or chemically-mediated water-gas shift (WGS) reaction: CO + H2O → CO2 + H2. During the biologically mediated reaction, a carbon monoxide dehydrogenase (CODH) oxidizes CO and electrons are released. Subsequently, a coupled hydrogenase reduces the released electrons to molecular hydrogen . Several mesophilic, anaerobic prokaryotic taxa, including Rhodospirillum rubrum and Rhodopseudomonas palustris, are known for the ability to perform the WGS reaction . It has been observed that higher yields of H2 can be obtained in higher temperature fermentations . Thus, there has been increasing interest in the use of thermophilic anaerobic bacteria, such as Carboxydothermus hydrogenoformans and Thermosinus carboxydivorans [12, 13], as well thermophilic archaea (e.g. Thermococcus onnurineus) . 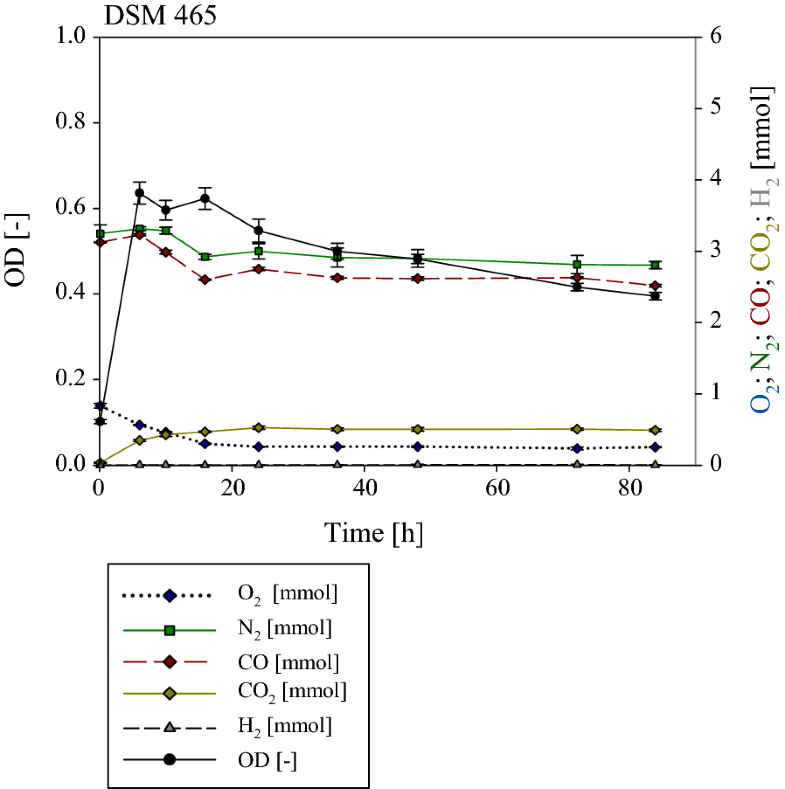 An industrial process utilizing CO-oxidizing bacteria for biohydrogen production has not yet been realized, although many CO-using hydrogenogenic species have been isolated. This may largely be attributed to the sensitivity of both the hydrogenase and CODH enzymes to oxygen [6, 14]. For example, the hydrogenase of Thermotoga maritima lost 80% of its activity after flushing with air for 10 s . Removal of O2 from industrial waste gases or from bioreactors is prohibitively expensive, making the use of strictly anaerobic CO-oxidizing hydrogenogens unfeasible . Here, we have analysed the hydrogenogenic capacity of the facultative anaerobe Parageobacillus thermoglucosidasius. Comparative genomics revealed the presence of three distinct hydrogenases, two uptake hydrogenases as well as one H2-evolving hydrogenase, which is linked to an anaerobic CODH. Evolutionary analysis showed that this combination of hydrogenases is unique to P. thermoglucosidasius and suggests that H2 plays a pivotal in the bioenergetics of this organism. Furthermore, fermentations and downstream GC analysis showed that this facultative anaerobe is capable of utilizing CO in the WGS reaction to generate an equimolar amount of H2 once most of the oxygen in the medium has been exhausted. The production of H2 by P. thermoglucosidasius when grown in the presence of CO was tested using P. thermoglucosidasius DSM 2542T. Two related strains, Geobacillus thermodenitrificans DSM 465T and P. toebii DSM 14590T, which lack orthologues of the three hydrogenase loci as well as the CODH locus, were included as controls. All strains were obtained from the DSMZ (Deutsche Sammlung von Mikroorganismen und Zellkulturen GmbH, Braunschweig, Germany). Pre-cultures and cultures were grown aerobically in mLB (modified Luria–Bertani) medium containing tryptone (1% w/v), yeast extract (0.5% w/v), NaCl (0.5% w/v), 1.25 ml/l NaOH (10% w/v), and 1 ml/l of each of the filter-sterilized stock solutions: 1.05 M nitrilotriacetic acid, 0.59 M MgSO4·7H2O, 0.91 M CaCl2·2H2O and 0.04 M FeSO4·7H2O. The first pre-culture was inoculated from glycerol stock (20 µl in 20 ml mLB) and cultivated for 24 h at 60 °C and rotation at 120 rpm in an Infors Thermotron (Infors AG, Bottmingen, Switzerland). A second pre-culture was inoculated from the first one to an OD600 of 0.1 and incubated as above for 12 h. For the experiments, 250 ml serum bottles were prepared with 50 ml mLB and a gas phase of 50% CO and 50% atmospheric air at 1 bar atmospheric pressure, which were inoculated with 1 ml from the second pre-culture. The experiments were conducted in quadruplicate for a total duration of 84 h.
Samples were taken at different time points during the experimental procedure. Before and after the sampling the pressure was measured using a manometer (GDH 14 AN, Greisinger electronic, Regenstauf, Germany). To monitor the growth of the cultures, 1 ml of the culture was aspirated through the stopper and absorbance was measured at OD600 using an Ultrospec 1100 pro spectrophotometer (Amersham Biosciences, USA). The determination of the gas compositions at different time points was conducted using a 3000 Micro GC gas analyzer (Inficon, Bad Ragaz, Switzerland) with the columns Molsieve and PLOT Q. A total of 3 ml was sampled from the head space and injected into the GC. A constant temperature of 80 °C was maintained during the total analysis time of 180 s. The gas compositions at the different sampling points were calculated using the formulas in Additional file 1. The large hydrogenase subunits were identified from the annotated genome of P. thermoglucosidasius DSM 2542T (CP012712.1) by comparison against the Hydrogenase DataBase (HyDB) . The full hydrogenase loci were identified by searching the genome up- and downstream of the large subunit gene, extracted and mapped against the genome using the CGView server . The proteins encoded on the genome were compared by BlastP against the NCBI non-redundant (nr) protein database to identify orthologous loci. Full loci were extracted from the comparator genomes and all loci were structurally annotated using Genemark.hmm prokaryotic v.2 . The resultant protein datasets were compared by local BlastP with Bioedit v 7.2.5  to identify orthologues, where orthology was assumed for those proteins sharing > 30% amino acid identity over 70% sequence coverage. A maximum likelihood (ML) phylogeny was constructed based on the amino acid sequences of three commonly used housekeeping markers: translation initiation factor IF-2 (InfB), DNA recombination and repair protein RecN RNA polymerase subunit B (RpoB). The proteins were individually aligned using M-Coffee , the alignments concatenated and poorly aligned regions were trimmed using Gblocks . Finally, the trimmed alignment was used to generate a ML phylogeny using PhyML-SMS, using the optimal amino acid substitution model as predicted by the Smart Model Selection tool [23, 24]. Similarly, ML phylogenies were constructed on the basis of the concatenated orthologous proteins encoded on the Pha, Phb, Phc and CODH loci. Analysis of the complete, annotated genome sequence of P. thermoglucosidasius DSM 2542T showed the presence of three putative [Ni-Fe]-hydrogenase loci on the chromosome. Two of these hydrogenases are encoded on the forward strand, while the third is located on the reverse strand (Fig. 1). Given the convoluted nomenclature of hydrogenase genes, we have termed these loci as Parageobacillus hydrogenase a, b and c, in accordance with their chromosomal locations), to distinguish between them. The Pha locus (chromosomal position 2,456,963–2,469,832; 12.9 kb in size) comprises eleven protein coding sequences (NCBI Accession ALF10692-10702; PhaA-PhaK) (Fig. 1; Additional file 2). Comparison of the amino acid sequence of the predicted catalytic subunit (ALF10727—PhaB) against HydDB  classifies the hydrogenase produced by this locus as a [Ni-Fe] group 1d uptake hydrogenase (E-value = 0.0). This unidirectional, membrane-bound, O2-tolerant hydrogenase is present in a broad range of obligately aerobic and facultatively anaerobic soil-borne, aquatic and host-associated taxa such as Ralstonia eutropha, Escherichia coli and Wolinella succinogenes [25, 26]. The H2 molecules consumed by group 1d hydrogenases are coupled to aerobic respiration (O2 as electron acceptor) or to respiratory reduction of various anaerobic electron acceptors including NO3−, SO42−, fumarate and CO2. The P. thermoglucosidasius DSM 2542T hydrogenase locus incorporates genes coding for both small (PhaA; ALF10692; 324 aa) and large (PhaB; ALF10693; 573 aa) catalytic hydrogenase subunits. The strain also encodes seven additional proteins involved in hydrogenase formation, maturation and incorporation of the Ni-Fe metallocenter, including a third hydrogenase subunit (PhaC) which is predicted to serve as cytochrome b orthologue and links the hydrogenase to the quinone pools of the respiratory chains (Fig. 1; Additional file 2) . The pha genes are flanked at the 5′ end by two genes coding for orthologues of the Twin-arginine translocation (Tat) pathway proteins TatA and TatC (Fig. 1; Additional file 2). These have been shown to form part of the membrane targeting and translocation (Mtt) pathway which targets the fully folded hydrogenase heterodimer to the membrane . The Phb locus (chromosomal position 2,488,614–2,503,714; 15.1 kb in size), located ~ 19 kb downstream of the Pha locus, comprises 16 protein coding sequences (NCBI Accession ALF10723-738; PhbA-PhbP) (Fig. 1; Additional file 2). The predicted catalytic subunit (ALF10727—PhbE) compared against HydDB classifies the product of this locus as a [Ni-Fe] group 2a uptake hydrogenase (E-value = 0.0) . Members of this group of uptake hydrogenases are widespread among aerobic soil bacteria and Cyanobacteria and play a role in recycling H2 produced by nitrogenase activity and fermentative pathways [28, 29]. The recycled H2 is used in hydrogenotrophic respiration with O2 serving as terminal electron acceptor, and thus group 2a hydrogenases are often O2-tolerant . This locus encodes both large (PhbE; ALF10727; 544 aa) and small (PhbD; ALF10726; 317) [Ni-Fe] hydrogenase subunits and eight additional proteins with predicted roles in hydrogenase formation, maturation and incorporation of the Ni-Fe metal center in the large subunit (Fig. 1; Additional file 2) . Furthermore, this locus encodes six proteins whose role in hydrogenase biosynthesis and functioning remains unclear. These include a tetratricopeptide-repeat (PhbH) and NHL repeat (PhbK) containing protein, which also occur in the [Ni-Fe] group 2a hydrogenase loci of Nostoc punctiforme ATCC 29133 and Nostoc sp. PCC 7120, where they are co-transcribed with the hydrogenase genes and have been suggested to play a role in protein–protein interactions and Fe–S cluster biogenesis (PhbJ) which may mediate electron transport to redox partners in downstream reactions . The Phc locus (chromosomal position 2,729,489–2,741,372), ~ 226 kb downstream of the Phb locus is 11.9 kb in size and encodes 12 distinct proteins (PhcA-PhcL) (Fig. 1; Additional file 2). These include a small (PhcE; ALF10919; 247 aa) and large (PhcG; ALF19021; 574 aa) [Ni-Fe]-hydrogenase catalytic subunit and ten additional proteins involved in hydrogenase formation and maturation (Fig. 1; Additional file 2). The HydDB classifies the Phc hydrogenase as a [Ni-Fe] group 4a hydrogenase or formate hydrogenlyase complex I (FHL-1) . Members of this group are oxygen-sensitive, membrane-bound and are largely restricted to the facultatively fermentative Proteobacteria, particularly enterobacteria associated with animal intestinal tracts [25, 26]. FHL-1 couples the reduction of protons from water to the anaerobic oxidation of formate to form CO2 and H2 [26, 31]. BlastP and tBlastN analyses of the protein sequences encoded in the P. thermoglucosidasius DSM 2542T hydrogenase loci showed that the Pha, Phb and Phc loci are universally present in eight other P. thermoglucosidasius strains for which genomes are available (Additional file 2: Table S1). These loci are highly syntenous and the encoded proteins share average amino acid identities of 99.73% ([Ni-Fe]-group 1d hydrogenase Pha—13 proteins), 99.61% ([Ni-Fe]-group 2a hydrogenase Phb—16 proteins) and 99.22% ([Ni-Fe]-group 4a hydrogenase Phc—12 proteins) with those of DSM 2542T, respectively. Pairwise BlastP analyses showed limited orthology between the two uptake hydrogenase loci, with 36.29% average amino acid identity in nine proteins encoded on the two loci. The group 1d (Pha) and group 2a (Phb) uptake hydrogenase loci share 33.40 and 62.32% average amino acid identity for three proteins with the H2 evolving hydrogenase (Phc) locus. The higher level of orthology for Phb and Phc loci proteins can be correlated with the HypA-like (PhbB and PhcK) and the HypB-like (PhbC and PhcL) proteins, which share 75.22 and 86.08% amino acid identity, respectively, and are predicted to play a role in the incorporation of nickel into the hydrogenase enzyme . Limited orthology is observed between the hydrogenase catalytic subunits or other hydrogenase formation and maturation proteins, suggesting distinct evolutionary histories for the two uptake and one H2-evolving hydrogenases in P. thermoglucosidasius. The proteins encoded by the Pha, Phb and Phc loci were used in BlastP comparisons against the NCBI non-redundant (nr) protein database and HydDB (catalytic subunits) to identify orthologous loci in other bacterial taxa. This revealed that, aside from the α-proteobacteria Azospirillum halopraeferens DSM 3675T and Rhodopseudomonas palustris BAL398, the combination of [Ni-Fe] group 1- 2- 4 hydrogenases appears to be unique to P. thermoglucosidasius (Fig. 2). In these two proteobacterial taxa the group 2a uptake hydrogenase is, however, replaced by a group 2b uptake hydrogenase. Group 2b uptake hydrogenases do not have a direct role in energy transduction but are flanked by a PAS domain protein which accepts the hydrogenase-liberated electrons, modulating the activity of a two-component regulator that upregulates the expression of other uptake hydrogenases, thereby serving as H2-sensing system [33, 34]. The Pha uptake hydrogenase locus is relatively well conserved among members of the Firmicutes, including a number of taxa belonging to the Classes Bacilli, Clostridia and Negativicutes, as well as the phyla Proteobacteria and Bacteroidetes (Fig. 2; Additional file 3). However, the more distantly related taxa retain little synteny with the Pha locus in P. thermoglucosidasius (Fig. 3a). Orthologues of the Pha are present in one other Parageobacillus spp., namely genomosp. NUB3621, with an average amino acid identity of 92.37% (13 proteins) with the DSM 2542T Pha proteins. A phylogeny on the basis of nine conserved Pha proteins (PhaABCDGHIJK) showed a similar branching pattern (Fig. 3a) as observed for the phylogeny housekeeping protein (InfB-RecN-RpoB) phylogeny, suggesting that this is an ancestral locus that has been vertically maintained. This is supported by the low level of discrepancy in G+C content for the P. thermoglucosidasius strains, which are on average 0.87% above the genomic G+C content. Larger discrepancies are, however, evident among the Bacteroidetes, where G+C contents for the locus are on average 4.43% above that of the genome, and the absence of Pha loci in other Parageobacillus spp. including P. toebii (five genomes available) and P. caldoxylosilyticus (four genomes available) and Geobacillus spp. suggest a more complex evolutionary history for the group 1d hydrogenase. Orthologous [Ni-Fe] group 2a uptake hydrogenase (Phb) loci are also common among the Firmicutes, but show a more restricted distribution within the family Bacillaceae, with only Aeribacillus pallidus 8m3 and Hydrogenibacillus schlegelii DSM 2000T containing orthologues outside the genus Parageobacillus. Highly conserved and syntenous loci are, however, present in three non-thermoglucosidasius strains: Parageobacillus sp. NUB3621, Parageobacillus sp. W-2 and P. toebii DSM 18751 (Fig. 3b; Additional file 3). 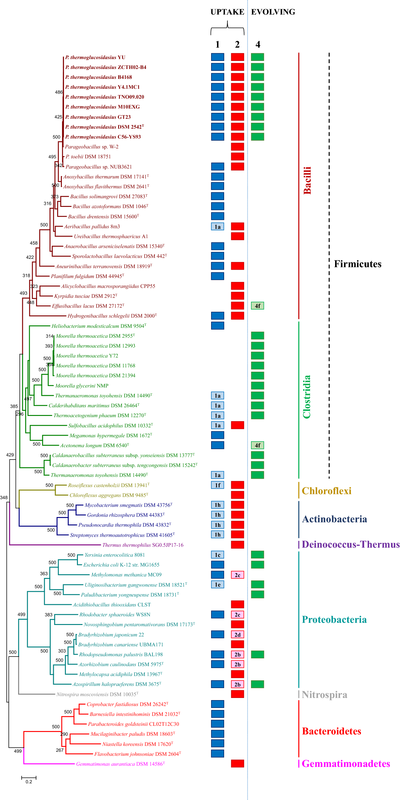 Orthologous loci are present across a much wider range of phyla than the Pha locus, including members of the Chloroflexi, Gemmatimonadetes, Actinobacteria, Proteobacteria, Nitrospirae and Deinococcus-Thermus (Fig. 2). The latter is of interest as Thermus thermophilus SG0.5JP17-16 clusters with the Firmicutes in a phylogeny of ten conserved proteins (PhbBCDEFHJLMN—72.76% average amino acid identity with P. thermoglucosidasius DSM 2542T) (Fig. 3b), but is phylogenetically disparate from the Firmicutes. The T. thermophilus locus is present on the plasmid pTHTHE1601 (NC_017273) suggesting that this locus forms part of the mobilome. Furthermore, the G+C content of the Phb locus differs by an average of 4.55% from the average genomic G+C among the eight compared P. thermoglucosidasius strains, suggesting recent horizontal acquisition of this locus. The [Ni-Fe] group 4a H2-evolving hydrogenase (Phc) locus shows the most restricted distribution of the three loci among the Firmicutes, with orthologous loci only present in the eight compared P. thermoglucosidasius strains and members of the clostridial family Thermoanaerobacteraceae (Fig. 2). Further, Phc-like loci appear to be restricted to members of the Proteobacteria. High levels of synteny and sequence conservation can be observed among the Phc loci in both phyla, with the exception of the PhcK and PhcL proteins, which are only present in the P. thermoglucosidasius and Moorella thermoacetica DSM 21394 Phc loci (Fig. 3c). BlastP analyses indicate that PhcK and PhcL show highest orthology with PhbB and PhbC in the Phb locus and may have been derived through gene duplication events. It is notable that the P. thermoglucosidasius Phc locus clusters with a subset of the Thermoanaerobacteraceae in the concatenated Phc protein phylogeny, including Moorella glycerini NMP, M. thermoacetica DSM 21394, Thermoanaeromonas toyohensis DSM 14490T, Caldanaerobacter subterraneus subsp. tencogensis DSM 15242T and subsp. yonseiensis DSM 13777T and Thermoanaerobacter sp. YS13 (Fig. 3c). These differ from the remaining Thermoanaerobacteraceae taxa and the proteobacterial orthologous loci in that they are flanked by three genes, cooCSF, coding for an anaerobic carbon monoxide (CO) dehydrogenase, rather than genes coding for a formate dehydrogenase (FdhH) as is typical for the [Ni-Fe] group 4a hydrogenases . These are generally accompanied by flanking genes coding for the formate dehydrogenase accessory sulfurtransferase protein FdhD, electron transporter HydN, transcriptional activator FhlA and formate transporters FdhC and FocA, which together with FdhH drive the anaerobic oxidation of formate (Fig. 3c) [26, 35–37]. BlastP analysis with the FdhH protein of M. thermoacetica DSM 2955T (AKX95035) shows that an orthologue is present in P. thermoglucosidasius DSM 2542T (ALF09582). The latter protein, however, shares limited orthology (39% amino acid identity; Bitscore: 497; E-value: 6e−614) with its M. thermoacetica counterpart and is furthermore localised ~ 1.5 Mb upstream of the Phc locus, suggesting the P. thermoglucosidasius FdhH protein does not function together with the [Ni-Fe] group 4a hydrogenase. Instead, the P. thermoglucosidasius Phc hydrogenase may form a novel complex with the adjacent anaerobic CODH locus. The three genes located just upstream of the Phc hydrogenase locus, cooC, cooS and cooF code for a CO dehydrogenase maturation factor (Figs. 3c, 4), a CO dehydrogenase catalytic subunit and CO dehydrogenase Fe–S protein, respectively. Together these proteins catalyse the oxidation of CO to generate CO2 (CO + H2O → CO2 + 2 H+ + 2ē). The electrons are then used in reduction reactions, including sulphate reduction, heavy metal reduction, acetogenesis, methanogenesis and hydrogenogenesis [38, 39]. The CODH locus is also co-localised with the Phc hydrogenase locus and highly conserved among the eight other P. thermoglucosidasius genomes (99.36% average amino acid identity with CooCSF in P. thermoglucosidasius DSM 2542T), while no CODH orthologues are encoded on the genomes of any other Parageobacillus or Geobacillus spp. A phylogeny on the basis of the conserved CooS and CooF proteins (Fig. 4) showed that, as with the Phc locus phylogeny (Fig. 3c), those taxa where cooCFS flanks the Phc hydrogenase locus cluster together and show extensive synteny in both the coo and phc gene clusters. This would suggest the co-evolution of the anaerobic CODH and Phc [Ni-Fe] group 4a hydrogenase loci. However, differences in the G+C contents could be observed among the P. thermoglucosidasius coo (average G+C content 46.97%) and phc (average G+C content 49.02%) loci. This is even more pronounced among the Thermoanaerobacteraceae with this CODH-Phc arrangement, where the G+C contents of the two loci differs by an average of 6.62% and is particularly evident in C. subterraneus subsp. tencongensis where the G+C contents of the coo and phc loci differ by 11.77%, suggesting independent evolution of these two loci. This is further support by the phylogeny (Fig. 4), where the CODH-Phc loci cluster with CODHs which appear on their own and those flanked by an NAD/FAD oxidoreductase are thought to play a role in oxidative stress response . The Energy Conserving Hydrogenase (ECH–[Ni-Fe] group 4c hydrogenase)-CODH complex, which has been shown to couple CO oxidation to proton reduction to H2 in C. hydrogenoformans and Rhodospirillum rubrum, clusters more distantly from the CODH-[Ni-Fe] group 4a complex [41, 42]. 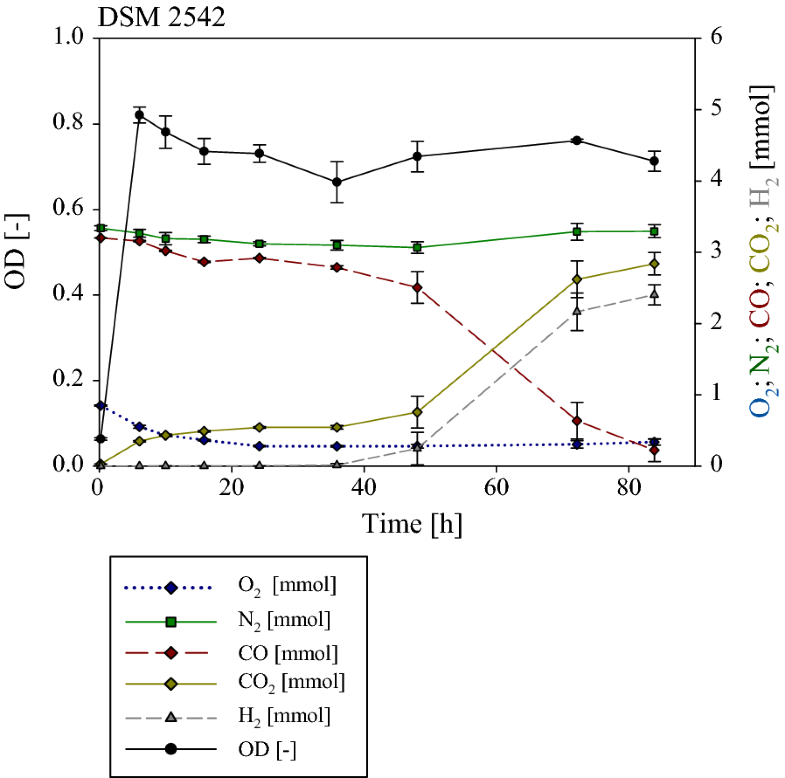 Overall, the results suggest that the CODH and [Ni-Fe] group 4a hydrogenase have evolved independently, but may form a complex linking CO oxidation to reduction of protons to produce CO2 and H2. The predicted function of the co-localized genes encoding the anaerobic CODH and H2-evolving hydrogenase (Fig. 3c) was tested using P. thermoglucosidasius DSM 2542T. Two related strains, Geobacillus thermodenitrificans DSM 465T and P. toebii DSM 14590T, which lack both orthologues of the three hydrogenases and the anaerobic CODH, were included as controls. 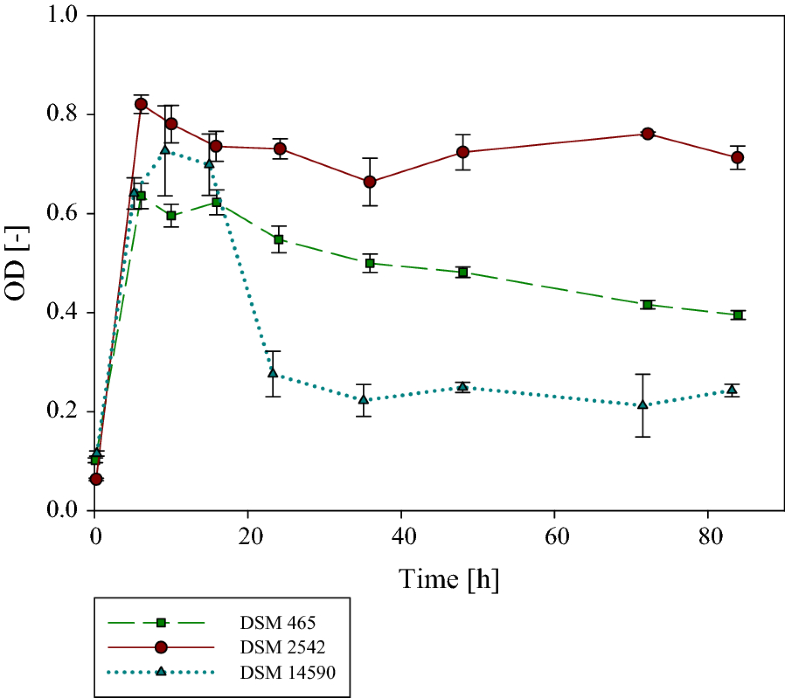 The cultivation of P. thermoglucosidasius DSM 2542T in serum bottles with a gas atmosphere consisting of 50% CO and 50% air showed that this strain was able to effectively grow in the presence of 50% CO, reaching a maximum absorbance of 0.82 after 6 h of cultivation (Fig. 5). 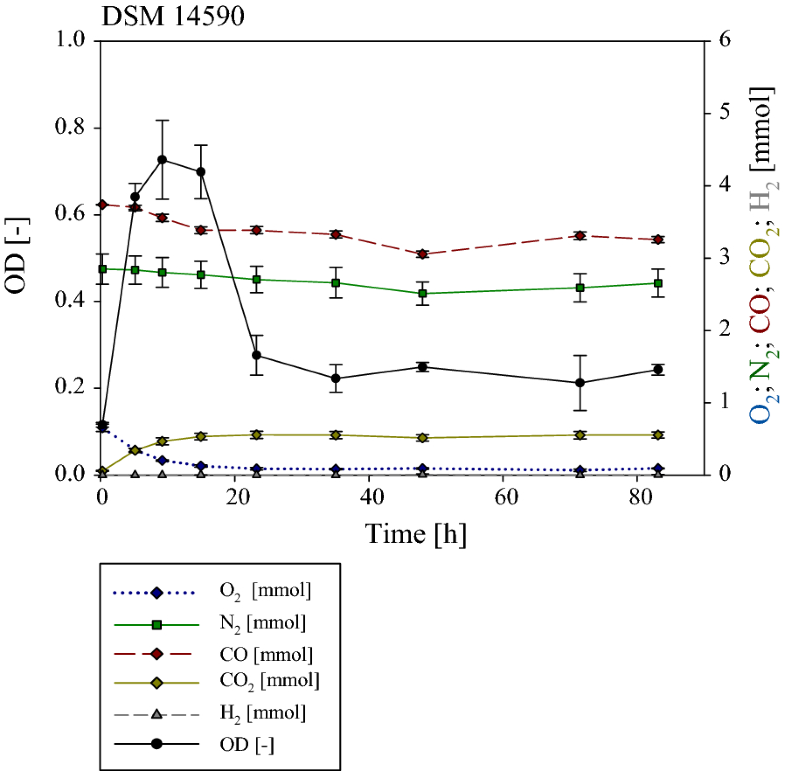 A fractional amount of CO was consumed at the beginning of the experiment, when oxygen was still available, by P. toebii DSM 14590T (0.37 mmol) and G. thermodenitrificans DSM 465T (0.216 mmol), respectively. This suggests that these strains may possess an alternative mechanism, such as an aerobic CO dehydrogenase, where CO oxidation is coupled to an electron transport chain which finally reduces oxygen . For instance, a predicted aerobic CODH is present (CoxMSL—OXB91742-744) in P. toebii DSM 14590T but is absent from G. thermodenitrificans DSM 465T. While the two control strains tolerated the presence of CO, no H2 production was observed for either strain (Figs. 6 and 7). By contrast GC analyses revealed the production of H2 by P. thermoglucosidasius DSM 2542T after ~ 36 h (Fig. 8). This corresponds with O2 reaching a plateau value of ~ 0.03 mmol. After 84 h 2.28 mmol CO was consumed and 2.47 mmol H2 produced. P. thermoglucosidasius DSM 2542T is thus capable of producing H2 at a near equimolar conversion to CO consumption once most residual oxygen has been exhausted with a final yield of 1.08 H2/CO. The redox potential and diffusion coefficient of molecular H2 make it a key component of metabolism and a potent energy source for many microbial taxa . The ability to utilize this energy source relies on the production of various hydrogenase enzymes, which power both the consumption and production of H2 and inextricably couple H2 to energy-yielding pathways such as acetogenesis, methanogenesis and respiration [26, 43]. 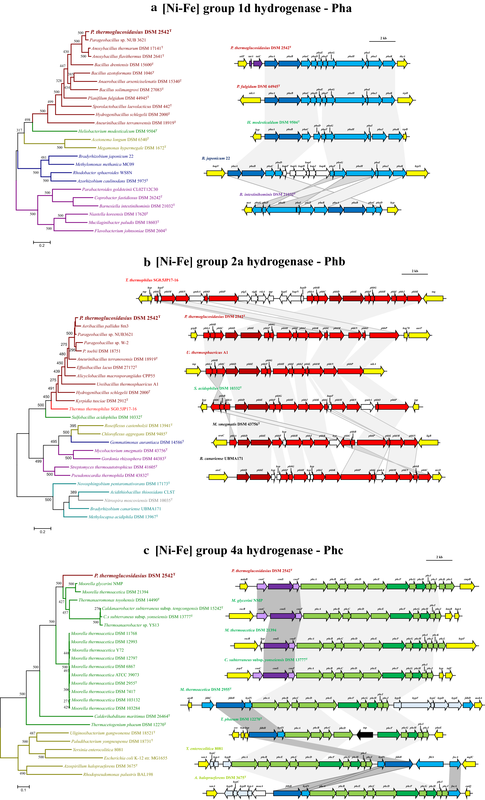 Our comparative genomic analysis revealed that P. thermoglucosidasius contains a unique hydrogenase compliment comprised of two uptake hydrogenases (group 1d and 2a) and one H2-evolving hydrogenase (group 4a). Evolutionary analysis showed that these hydrogenases are derived through three independent evolutionary events. This indicates that H2 is likely to play a pivotal role in P. thermoglucosidasius metabolism and bioenergetics in the ecological niches it occupies. By contrast, members of the sister genus Geobacillus lack orthologous hydrogenase loci and, aside from P. thermoglucosidasius, only the group 1d and 2a uptake hydrogenases share orthology in one and three Parageobacillus spp., respectively, even though they are frequently isolated from the same environments. The group 4a H2-evolving hydrogenase of P. thermoglucosidasius is not found in any other members of the class Bacilli and is most closely related to those found in members belonging to the class Clostridia, particularly the family Thermoanaerobacteraceae. Furthermore, it forms an association with a CODH, which is found in common with a more restricted subclade of strict anaerobes within the family Thermoanaerobacteraceae. Our fermentation studies with P. thermoglucosidasius in the presence of CO showed that P. thermoglucosidasius grows efficiently when exposed to high concentrations of CO and that the CODH-group 4a hydrogenase complex can effectively couple CO oxidation to H2 evolution, P. thermoglucosidasius can do so at a near-equimolar conversion. Furthermore, unlike other CO oxidizing hydrogenogenic bacteria, which are strict anaerobes, P. thermoglucosidasius is a facultative anaerobe capable of first removing residual oxygen from CO gas sources prior to producing H2 via the water-gas shift reaction. The combination of these features makes P. thermoglucosidasius an attractive target for potential incorporation in industrial-scale production strategies of biohydrogen. TM planned the experiments, collected and analyzed the experimental data. HA, PM, SP and TM conducted the genomic analysis. RK conducted his Bachelor thesis under the supervision of MZ and AN. AN and DC substantially contributed to conception and design of the experiments. AN, HA, PM and TM drafted the manuscript. All authors read and approved the final manuscript. TM was supported by the Federal Ministry of Education and Research (Grant #031B0180). PDM was funded by the National Research Foundation of South Africa (Grant #109137). HA acknowledges funding from Alexander von Humboldt Foundation. All the data can be found within the article and its additional files. All the authors agree to submission. 12934_2018_954_MOESM1_ESM.docx Additional file 1. Calculation of the gas composition. Description of the calculation of the gas composition by using the ideal gas law. 12934_2018_954_MOESM2_ESM.xlsx Additional file 2. 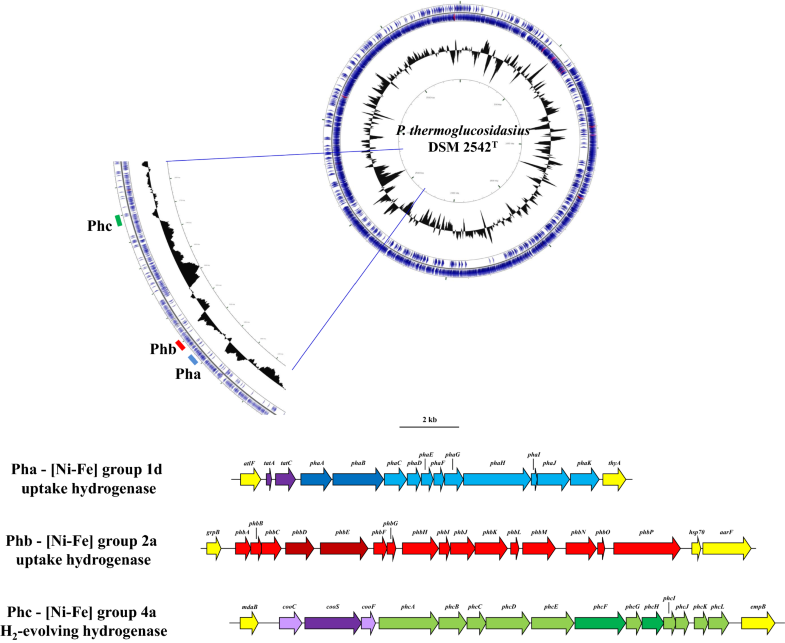 Annotations of the CODH and [Ni-Fe] hydrogenase loci of P. thermoglucosidasius DSM 2542T. The locus tags, sizes, protein names as well as the functions of the proteins in the three [Ni-Fe] hydrogenase loci and the anaerobic CODH locus of P. thermoglucosidasius DSM 2542T. BlastP data (locus tag, average amino acid identity, bitscore and e-value) for the closest non-Parageobacillus orthologue and the top conserved domain for each P. thermoglucosidasius DSM 2542T protein are shown. 12934_2018_954_MOESM3_ESM.xlsx Additional file 3. Orthologous [Ni-Fe] hydrogenase and anaerobic CODH loci in Parageobacillus and other taxa. The locus size, G+C content, G+C deviation of the orthologous [Ni-Fe] hydrogenase and anaerobic CODH loci of other P. thermoglucosidasius strains and distinct taxa as used in Figs. 2, 3 and 4. The number of protein orthologous and average amino acid identity of these proteins to those encoded on the P. thermoglucosidasius DSM 2542T loci are indicated. International Energy Agency. World Energy Outlook 2017. 2017. https://www.iea.org/weo2017. Accessed 26 Mar 2018.